This stupa has a relic of the Buddha buried there. Arriving back into Bangkok from Chiang Mai was a relief as was getting into a room with air conditioning. We took an overnight bus from Chiang Mai and collectively between us we didn’t get enough sleep even for one person. We were over the stickiness of the north too. The next day a friend that Ben made in Pattaya (her name is Joy) invited the three of us down to Hua Hin for a weekend away. Hua Hin is a coastal city of 60,000 people and 190km south of Bangkok. The King of Thailand has his summer palace Ratchaniwet Marukhathaiyawan (The Palace of Love and Hope) which we visited on the second day. A three-hour bus trip suffered a small delay, while the King of Thailand was returning to Bangkok. In these instances the police halt all traffic 2 kilometres ahead of the King’s procession. At the time though we had no idea what was going on. We arrived in Hua Hin in late afternoon and we took motorbike taxis to our hotel. I was a little apprehensive about riding on the back of bikes as I wouldn’t be covered by insurance if something happened. My attitude changed (meaning more relaxed) later through our trip. For the rest of the day we hung out at the beach and relaxed. The next day at 10.30am we visited the temples of Khao Takiab, fed the monkeys and a climb to the viewpoint. The monkeys here are adept at stealing. Sam had his bag of peanuts pinched when the monkey he was feeding leapt up and grabbed the bag. After sweltering in the heat for over an hour it was back to the van and on to visit the Ratchaniwet Marukhathaiyawan Palace. The higher teak walkways and airy rooms offer a beautiful view of the beach and Gulf of Thailand. We walked around for an hour and it was back into the mini van. Last on the agenda was the mount side temple of Khao Chong Krachok. It was a relief to see that there was a railcar that transports passengers up and down the mountain. I was interested to see that the attendant had an air-rifle in handy reach and the reason became obvious at the end of the short ascent. There are a few monkeys roaming round on the mountain, and they have learned not to fear humans. We found one poor Thai woman complaining that a monkey had bitten her. The main attraction of the mountain is a monastery. Unfortunately we had to walk up the steps (395 of them!) to get the top. 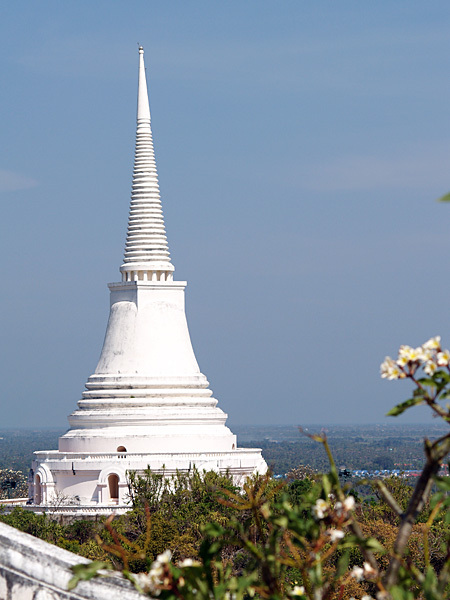 Also sharing the top of the mountain is a white stupa that has a relic of the Buddha. We took some good photos of the view at the top, but by now I think it was time to go back to the hotel and have a shower. The weekend came to a close and Joy had to go back to work on Monday. For us though, our next course was to head south.